The treasure hunt begins on 6/12 over at The Altered Page, as participating art bloggers come together to share past posts we love & to collaborate as part of Seth Apter’s Buried Treasure Project. The concept is awesome: Seth will be posting a list of all our posts so we and others can discover lots of artsy online hidden treasure and creative goodness. I’m re-posting one of my favorite blog posts, What Ought to Be: On Untangling and Putting Fragments Back Together with Art from the Creativity in Motion archives in 2010. I selected this post because it symbolizes many core beliefs I have about art-making’s ability to create transformation out of moments full of uncertainty and vulnerability. Earlier in the week I was reading a post about what daily meditation can do for your creativity and wrote down these words that the author, Mark McGuinness highlighted: Focus, Patience, Calmness, Clarity, Insight, and Perspective with the intention to reflect on the state of my own mental clarity and what McGuinness described perfectly as “getting tangled up in thoughts”. As the week went on, I lost track of this intention. What did follow was lots of tangling and static coming from many sources and by the end of the week, my mind felt like it was in tight knots unable to make sense of anything or what to do next. Except for one thing: to make art. When I am having a hard time understanding what’s happening around me or within, art-making usually helps me start to untangle everything and invite many of the qualities listed in McGuinness’ post. This past week in particular, I was really thinking about themes related to shattering, fragmenting and scatteredness… feeling this within and wanting to do something constructive and meditative to make these pieces more containable and start to put them back together for my sanity and my ability to keep moving forward with fresh eyes, a clearer head, and creative mind. 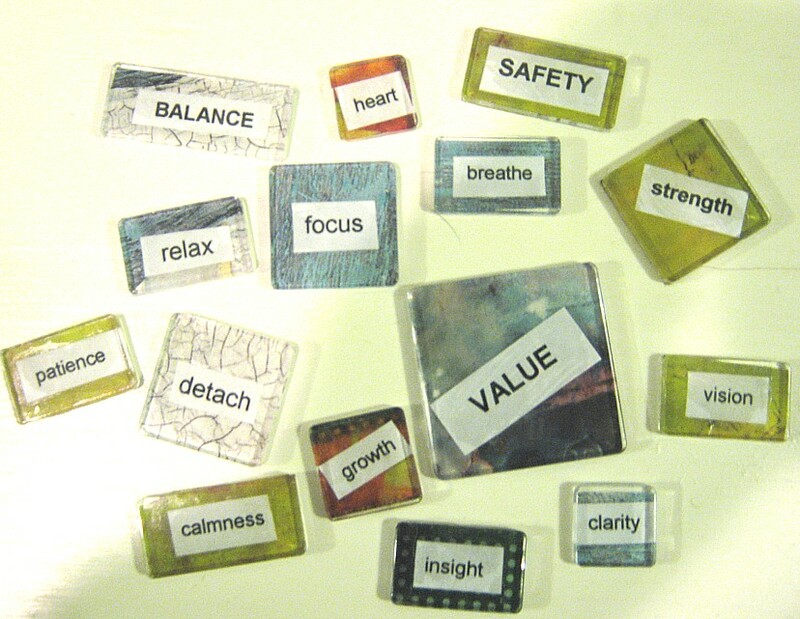 I used several square and rectangle plastic “Fragments” from Tim Holtz’s idea-ology and adhered the words I wrote down from McGuinness’ list and others important to my untangling process. 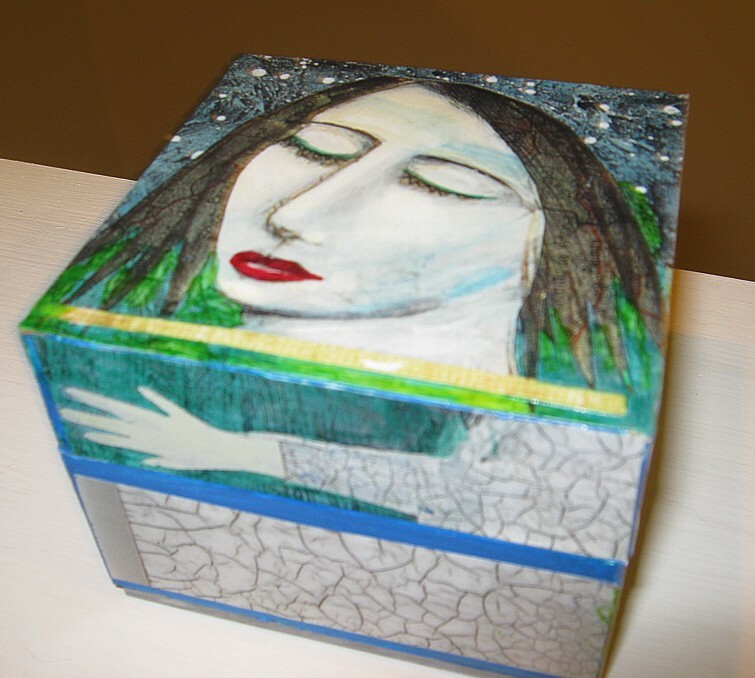 Holtz’s “Fragments” are small clear tiles that can be embellished by adhering patterned paper to, inking, or gluing on printed paper for creating “a concept or thought developed by the mind of what is desireable or ought to be“. 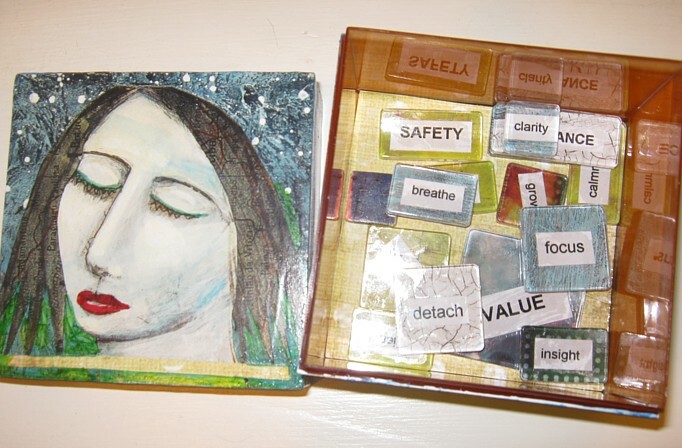 I also collaged a box to hold and contain these fragments of “what ought to be”. Developing and containing these fragments through this process reminded me (again) of my core intentions, purpose, and helped “untangle” most of the “thought knots”, as well as put back and contain all the little pieces of me that were scattered everywhere and ought to be paid attention to for continued creativity, energy, and collaboration. Altered DSM: Ron Huxley and some of his therapist friends created this altered book using the old DSM III (Diagnostic and Statistical Manual for Mental Disorders) and posted the photos on a Flickr photostream. I love this idea! Thanks Ron for sharing this project! FYI: The book is available to show in galleries or conferences. The next phase of the project includes the artists taking their disintergrated bundle and making it into a new art piece. I know I’ll be watching to see what transforms! 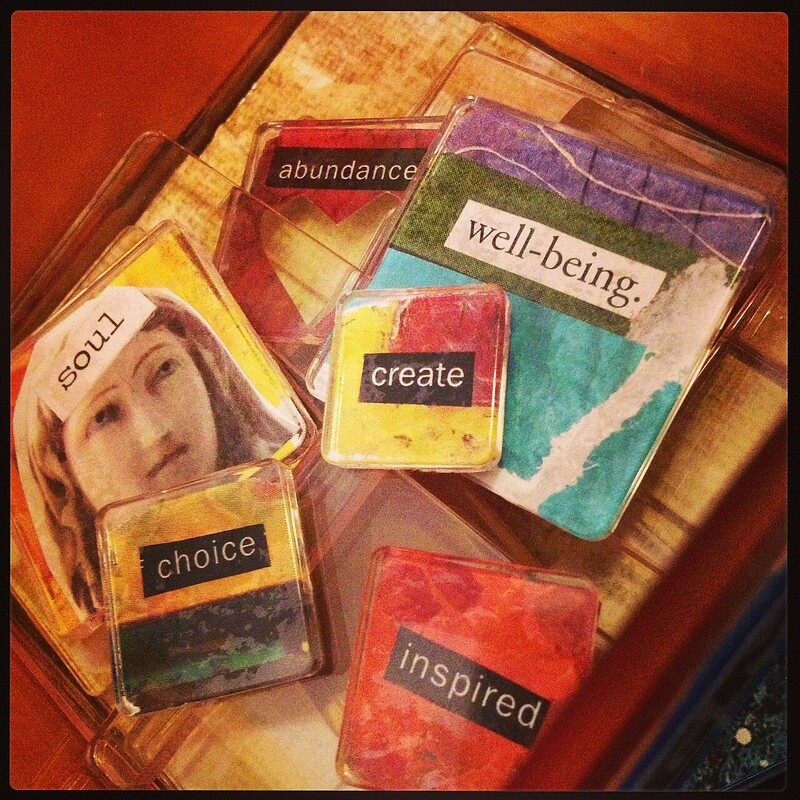 I always love to see how others use altered art and collaborative projects to explore different themes and topics. Feel free to post and suggest any interesting ones you may know of!